The piece was composed using a multidimensional compositional timbre model Reid developed while at Stanford University. The composition explores timbre through dozens of bell sounds, which provide the harmonic and timbral material, structure, foreground, and background for the piece. The composition is comprised of five sections, each examining a different set of bells and materials that interact with them. The piece begins thin and bright, then gradually increases in spectral and textural density until the listener is enveloped by a thick sound mass of ringing bells. The bells gently fade into waves of rich harmonic resonances. Sk(etch) is an acousmatic work that explores sounds, gestures, textures, and timbres associated with the creative process of sketching, drawing, writing, and composing. 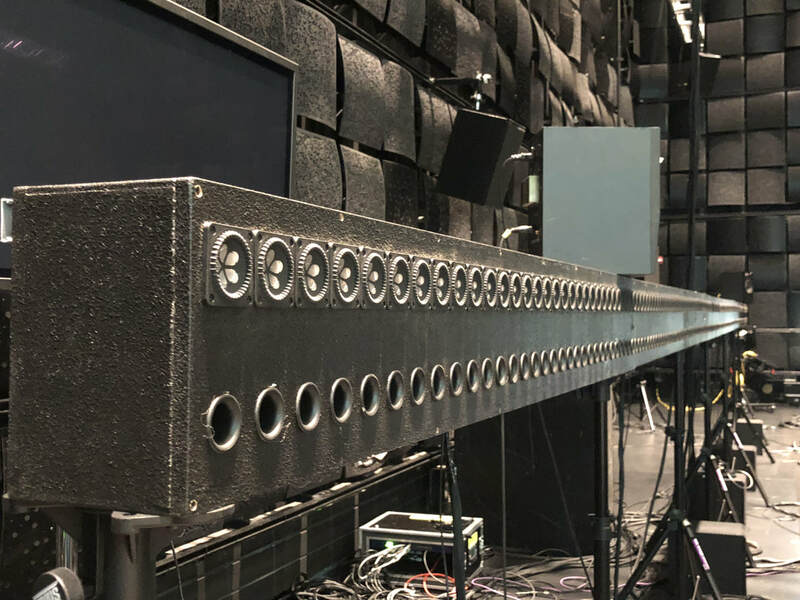 The work was composed with two projects in mind: working with EMPAC’s wave field synthesis array and for Núcleo Música Nova’s «microFOLIA» project. Crumbs, for amplified percussion and electronics, is an aphoristic composition that explores delicate grains, sounds, and textures. The work was designed to be portable. The instruments and found objects used in the live-percussion part can easily fit inside a small box. The work is comprised of six short sections, each examining a unique set of small handheld percussion instruments and common household items. The work is centered around a 5:1 ratio, which controls the piece’s proportions and the distribution of the number of attacks per section. Each of the first five sections are composed of two gestures: 1 decelerating and 1 accelerating. Their weighted proportions gradually shift from a 5:1 to a 1:5 ratio. The 6th section is divided into 5 additional parts that mirror the largescale proportions in the piece. The work begins with small, bright, effervescent grains, and gradually incorporates larger, deeper, and more resonant textures. Sparrow (Spero) is piece for flute, horn, percussion, piano, violin, and 7.1 channel live-electronics. The material for the piece was derived from recordings of a bell that is housed in a meeting house in the composer's hometown of Jaffrey, NH. Similar to many New England towns, this bell sounds every hour. While it is one of the sounds of Reid's childhood, the bell’s location and history are also important. It is housed in a meeting house that was erected on June 17, 1775 during the battle of Bunker Hill. Tradition tells us that the workers could hear the sounds of cannon fire from Charlestown. The bell tower was added in 1822 and the bell was cast by the Paul Revere Foundry (Stephenson & Seiberling, 1994). The form for Sparrow (Spero) is based on the structure of this bell sound and explores both interactive electronics and the concept of using timbre as a structuring device. Sparrow (Spero) received an Honorary Mention in the International Alliance for Women in Music’s Pauline Oliveros Award in 2010. Pressure, for viola and live-electronics, is a single movement work that explores the timbral possibilities of the instrument from scroll to tailpiece. The composition contrasts delicate gestures, melodies, and squeaks, with dense sweeping textures, flurries of tapping, and waterfalls of glissandi harmonics. The word ‘pressure’ has multiple different meanings, two of which particularly exemplify this work: to push toward a definitive end, and the exertion of force upon an object. Through various extended techniques, including unusual finger and bow placements, tapping, and extreme bow pressure, the physical force on the viola can be seen as well as heard. The electronics for Pressure are realized with Max/MSP. In the piece, the soloist’s sounds are amplified, processed, and spatialized using predetermined trajectories. The live sound is combined with the synchronized playback of prepared sound files. The resulting textures surround and immerse the listener in a vibrant soundscape. The electronics color, transform, and expand the possibilities of the solo instrument, allowing a pizzicato to have a gong-like resonance one moment and a heavy metal electric guitar timbre the next; or enabling a monophonic gesture to be multiplied a hundred fold into a thunderous orchestral buzzing. Pressure was composed for violist Drew Ricciardi at McGill University in Montreal, QC in 2007. The work received the International Alliance for Women in Music’s (IAWM) Pauline Oliveros Prize in 2008, and is featured on Ablaze Records' Electronic Masters Vol. 5 disc.